I grew up drinking some sort of tea. Tea was a part of the Filipino diet, but I remember that it was mostly for medicinal purposes. Ginger tea was for sore throats and laryngitis. Peppermint was for muscle aches and pains. My dad had this plant called kumis kucing that everyone swore helped kidney issues and kidney stones. Being an Anglophile at a very young age, I always had tea, with lemon and not cream, although this was probably not very British in the afternoons while I was studying. I had tea in a cup and a saucer (most probably with my pinkie in the air too!). I felt very grown up with my tea and my slice of lemon (which was actually a wedge of calamansi, the indigenous citrus fruit from the Philippines). It wasn’t until I saw this film about a little girl, all dressed up, going to a posh looking restaurant being served tea, dainty sandwiches and being asked by a waiter to choose cakes from a heavily laden trolley that I started reading about “proper” afternoon tea. 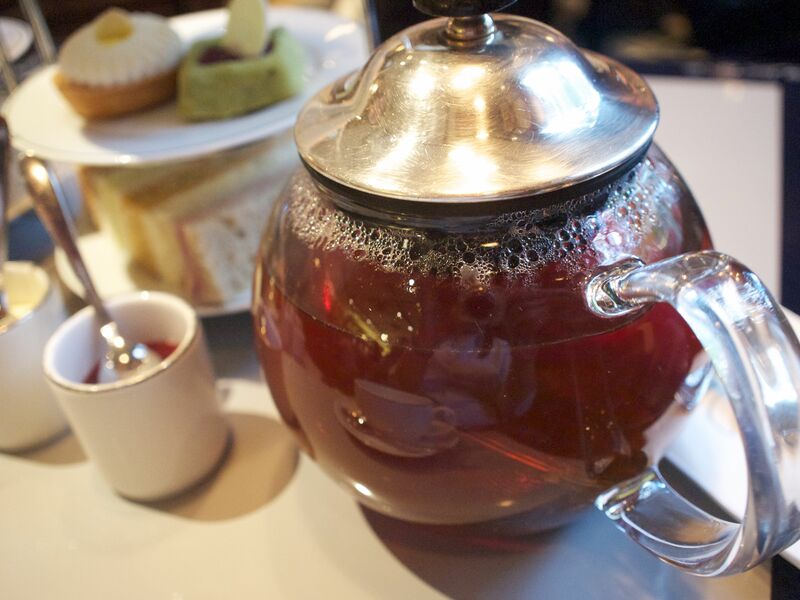 Afternoon tea is a small meal typically eaten between 3PM and 5PM. The Duchess of Bedford is rumoured to have transformed afternoon tea into a late afternoon meal rather than just a simple way of getting refreshment. As far as I understand it, there are 2 types of afternoon tea: high tea and cream tea. High tea is also known as a meat tea where one is served savoury and sweet dishes. Cucumber sandwiches and smoked salmon sandwiches are usually a staple. And of course one gets the cakes and the scones, clotted cream and jam. Another kind of afternoon tea is the cream tea. Cream tea is usually tea served with scones and clotted cream. Since moving to the UK, I’ve been wanting to go to afternoon tea. I wanted to go to a proper high tea with silver service but they were quite pricey. Since I quite enjoyed baking, one aspect of afternoon tea that I knew I was going to enjoy was looking at all the pretty cakes served on those pretty cake stands. 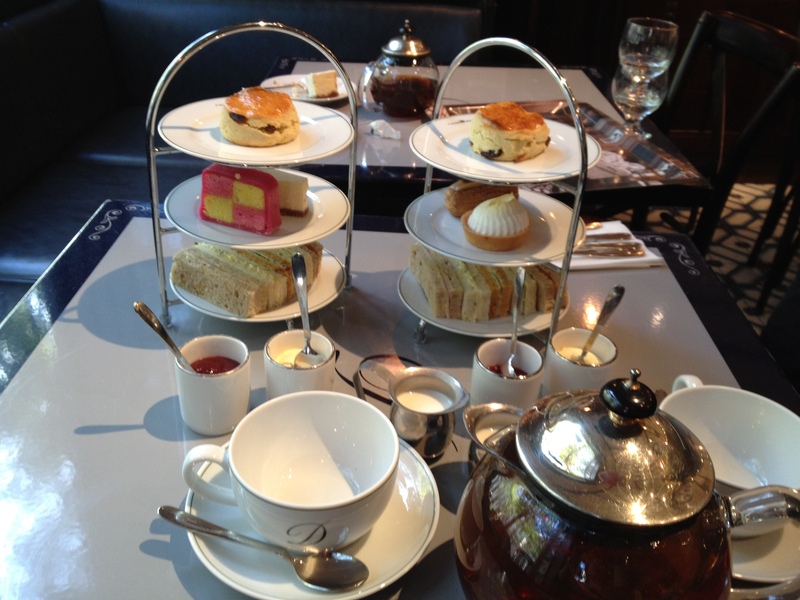 I first attempted to find a place serving afternoon tea somewhere near me. But I couldn’t really find anywhere suitable. The London locations were fairly expensive but I really wanted to try it so to me, it was a matter of finding the right place and making the appropo reservations. Funny how the most wonderful experiences are the most unexpected. The Delaunay Counter was a restaurant that I often saw but never really considered. It looked terribly posh from outside so I automatically assumed that the prices would be way beyond my budget. 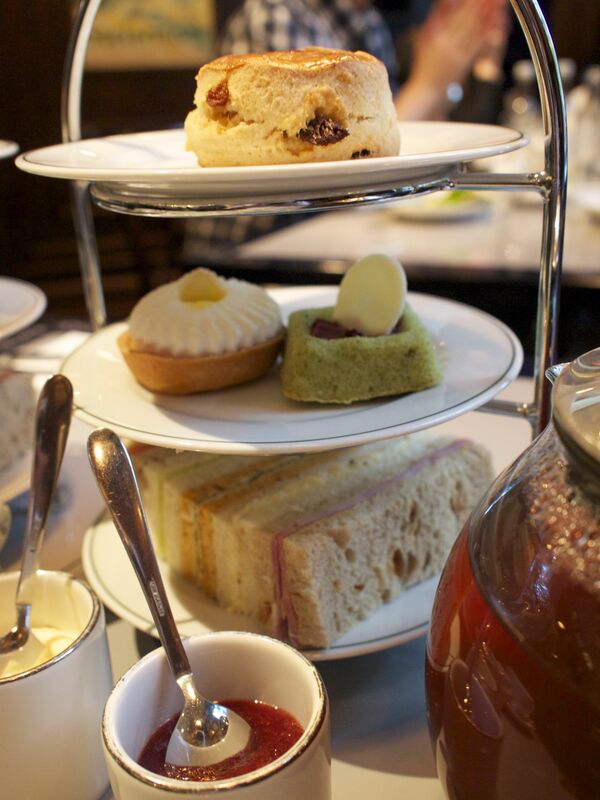 But a few weeks ago, I actually looked at the prices and found them quite reasonable and I made a mental note to go back there for afternoon tea because £11.75 per person was a reasonable price to pay for afternoon tea (I promptly lost that mental note!). When I finally remembered to go (after Alan reminded me!) I wasn’t expecting much. The Delaunay Counter was mostly a self-serve and take away part of the The Delaunay Restaurant and if you wanted to eat in, you went to the counter to place your order. But the staff were lovely and absolutely friendly, and when the tea was brought to us, I thought the price we paid was more than reasonable! You get a pot of tea, enough milk for your tea, 5 different types of sandwiches, 2 different cakes, a scone and clotted cream and jam. Everything is presented very beautifully on a 3-tiered cake stand and glass tea pot. You get to choose your tea. I love a good strong tea, but apparently, traditionally (and I could be wrong! ), you should choose Earl Grey or English Breakfast. Only recently have I learned that Assam is also a good tea to choose for afternoon tea as its strong flavour compliments the savoury and sweet elements from the food served. If you are looking for a place to have tea, head on to the Delaunay Counter on 55 Aldwych Street (it’s near the theatre where Mamma Mia is) in London. The place is lovely, with a lot of quirky Austrian-themed posters in lovely wooden frames. The staff are lovely but efficient. Apart from the afternoon tea, there is a lovely (and very tempting) selection of cakes. They, apparently, have the best Sacher Torte in London and I am quite inclined to agree having sampled it myself. They also serve salads and hot sandwiches and they do a daily roast too. According to the menu they also serve breakfasts from 7AM on weekdays. There is a distinct Austrian feel to the menu with the schnitzels and the gugelhopfs on offer. But it is definitely worth the visit. You won’t regret it!